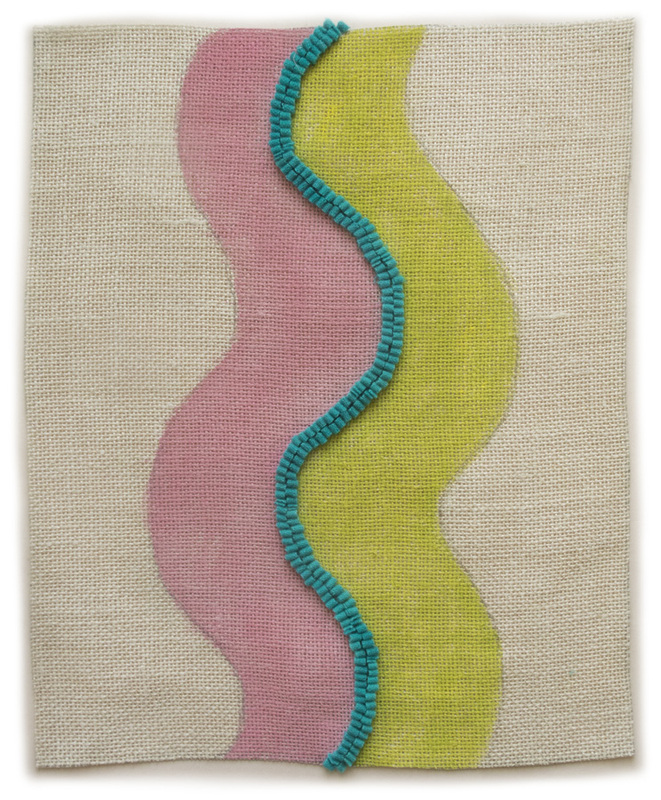 2015 #9, hand dyed wool and egg tempera on linen, 15 x 12 in. 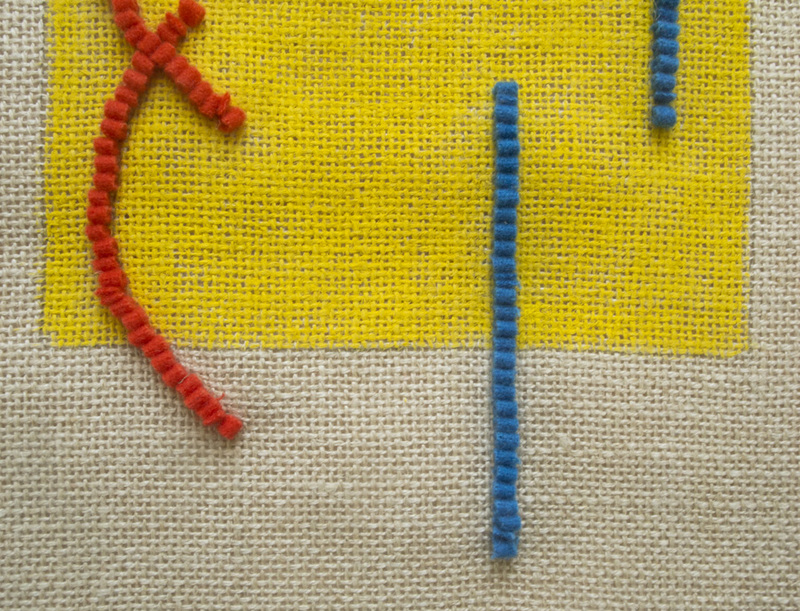 Like my last group of hooked wool drawings, which you can see here, hooked wool lines anchor the structure of these new compositions. Using line alone, without hooked shapes, is not something I set out to do; it just happened. In the piece above, I used a sinuous double line, more curvy than my usual curves; the color emphasizes a bit of cartoony goofiness. 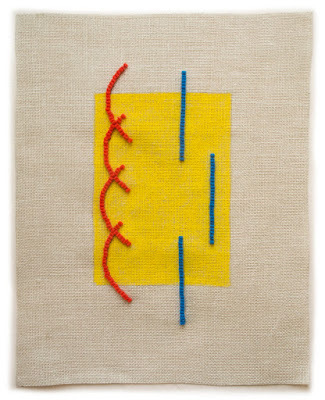 2015 #10, for Ellsworth Kelly, hand dyed wool and egg tempera on linen, 20 x 19 1/2 in. 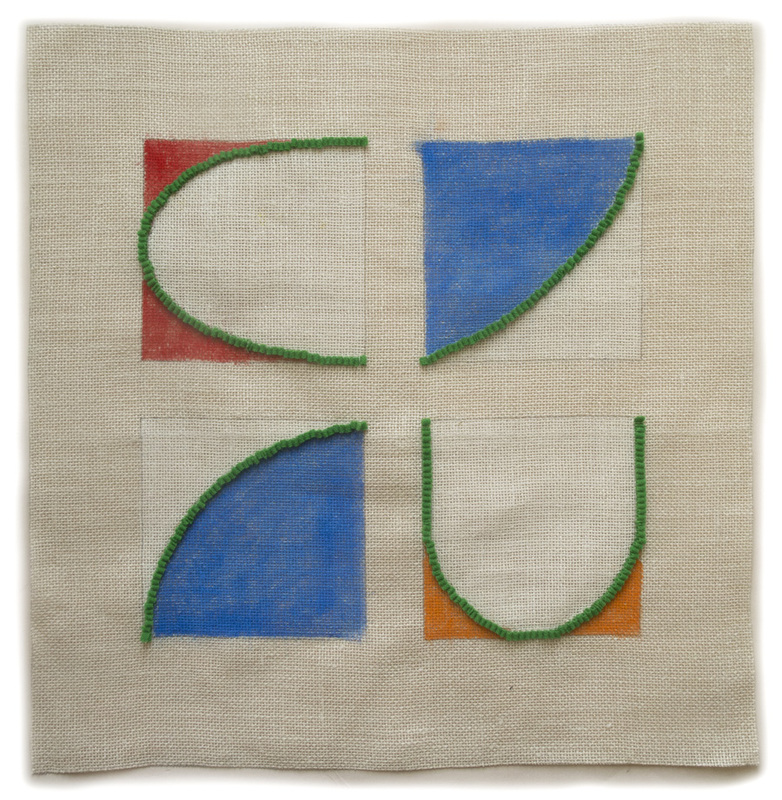 These simple curves are an homage to Ellsworth Kelly, a great artist, who has continued to paint and advance his work at the age of 92. 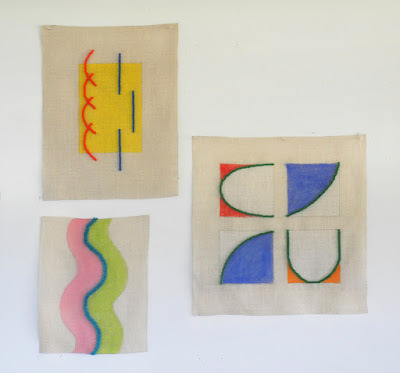 At first I thought I'd make four separate pieces, but then felt that the work would be more compelling on a single piece of linen. Each section is one color with white, and a Kelly green line. 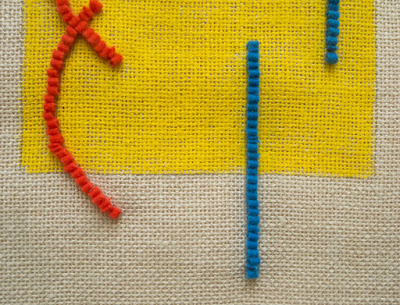 When I photographed this detail, I realized that I'd left the little tails of the wool dangling at the top and bottom of the green line to the left. Taking photos can focus the attention. 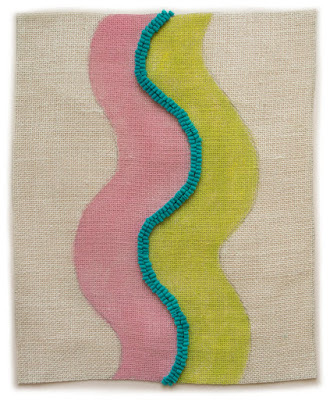 2015 #11, hand dyed wool and egg tempera on linen, 19 x 15 in. 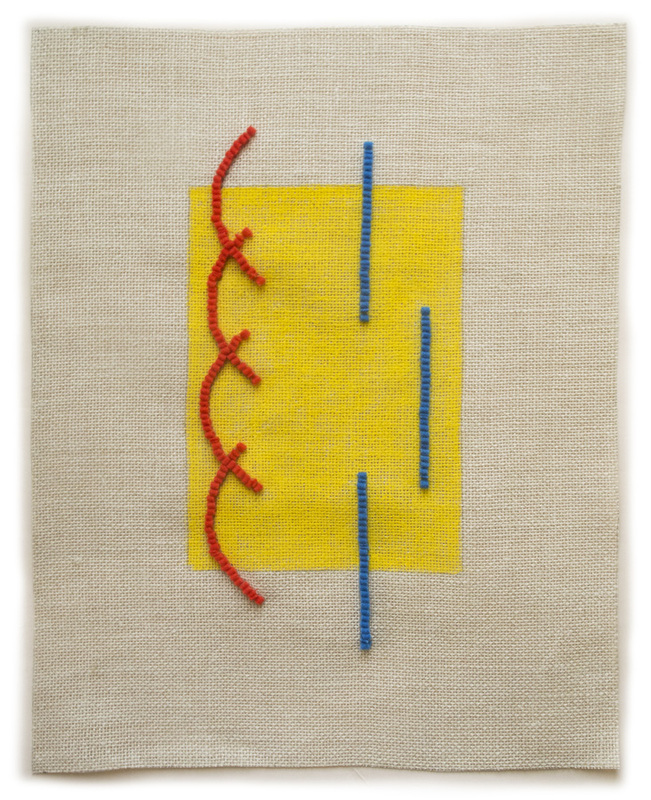 Primary colors; lines straight and curved, isolated and interlocking; all floating on a linen ground. Lines can do such different things, and can evoke different moods and qualities. Here are the three pieces hanging together on the wall, to give a sense of their sizes, which is hard to tell from individual photos. I love these colors. So cheerful. Lots of movement. 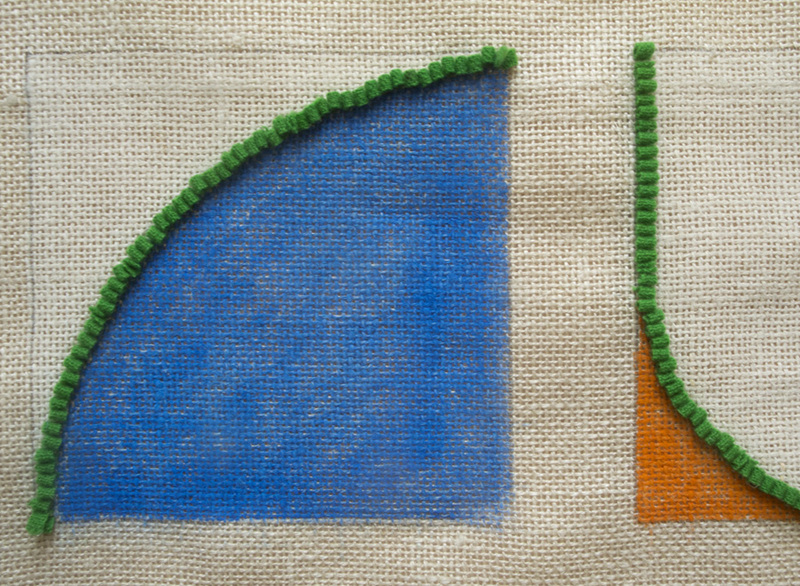 A New Painting: "Bar and Shadow"
A New Textile: "Two Curves"
A New Painting: "Dark Ellipse"